If you regularly spend time in the woods, wilderness, mountains, on water or in any other places in which you may be faced with emergencies and may have to rely on your ability for survival, it's important to know what to do and what your priorities should be. In fact, it's useful to enrol on even the most basic of survival courses as they will help you become more prepared should you find yourself in a real 'life or death' survival situation. Knowing your priorities is one thing but that will all count for nothing unless you're mentally prepared too. It's important to remain calm, think rationally and sometimes, be creative when it comes to survival in an emergency. A shelter is crucial on a number of levels. Firstly, it will help to protect you from any adverse weather and the possibility of suffering from hypothermia. It will also enable you to sleep in order to restore your energy levels which you'll be needing to get out of the predicament and as it will become your temporary 'home', it will also boost your morale. Shelters may be found naturally, small cave openings on mountainsides, for example, but you may need to be resourceful and imaginative and use what is at hand. Leaves, rocks, branches and ferns can all be used to make a shelter and, as a good survival tip, you should ensure you build it in a location which won't be flooded and which is protected from strong winds. Once you have built your shelter, the next thing to do is to light a fire. This will have many uses. Firstly, it will keep you warm which, in turn, will boost your morale. It's also important for cooking food and for purifying water. It can also act as a repellent - keeping away unwanted insects and perhaps, any dangerous animals that may be lurking around and can also be used as a signalling device for rescue purposes. Water is your next survival priority. Although you may be hungry, you can survive without food for several weeks whereas you can only survive around 3 days without water. There is another article on this website which tells you various ways you can go about collecting water and how to ensure its safety but another useful survival tip for conserving your water retention levels is to try to carry out any physical duties at night or early in the morning when temperatures are cooler, not eating too much as your body uses a lot of water to digest food and breathing through your nose is preferable as it prevents water vapour escaping through your mouth. Without an adequate supply of water, you'll eventually succumb to dehydration which will result in headaches, dizziness, nausea, lethargy, confusion and ultimately, death. If you or any of your party are suffering any injuries or illnesses, now's the time to treat them unless their injuries or sickness are so severe that you've needed to do that earlier. Therefore, it's imperative that you have an adequate first aid kit with you and just as importantly, know how to use it. Finding food comes next if you have none and it's useful to have some basic fishing and hunting skills and to be able to recognise edible plants, berries and vegetation. More information can be found in other articles on this site. Once all of the above basic needs have been met, you'll be looking to try to get out of the situation. If you have the necessary equipment and navigational skills to enable you to do that safely, that should be your next action. Alternatively, if you're completely lost, stranded and/or the weather prevents you from getting out of the dilemma yourself, your next step will be to signal for help and more information is contained within another survival article on this site. A calm, yet steely, determination for survival coupled with your understanding of the major priorities when faced with a survival situation and acting upon them will give you the best opportunity for getting out of it alive. All this is good advice, but if you're not prepared it won't help much. 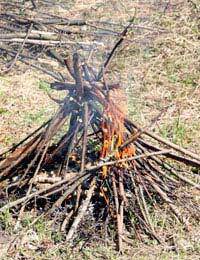 It's worth knowing where and more particularly how to build a shelter that won't fall apart during the night and how to start a fire without matches, for instance. While you probably won't be out in the wilds long enough to have to find food, it's worth knowing what roots and berries are edible and which can poison you. Everyone going on extended hikes should learn these basic skills, just in case.